The Caribbean coast of Costa Rica offers some of the most exciting nature expeditions. Fifty miles north of Limon on the Caribbean shore lies Tortuguero National Park, one of the few remaining strongholds of tropical wildlife. 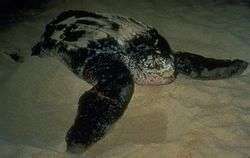 Tortuguero (which means "Turtle Place"), is recognized internationally for its sea turtles. 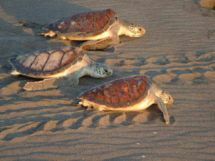 At certain times it is possible to observe the turtles nesting on the beach at night and newly hatched turtles scrambling from the nest to the sea (see below for the nesting schedule). 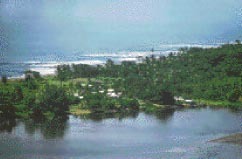 There are walks on the beach by night and river trips by day for observing birds and monkeys. 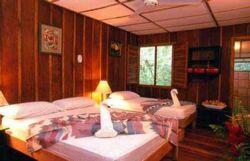 Located in the Northeast area of Costa Rica's Caribbean coast, Mawamba Lodge is set in 15 tropical acres on the eastern shore of Tortuguero Canal between Tortuguero Lagoon and the Caribbean Sea. It is the ideal hideaway for nature lovers and people seeking soft adventure. 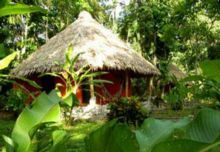 Its beautiful gardens and rustic accommodations blend with the exuberant jungle vegetation, exotic birds and wildlife, creating a perfect balance with nature. The lodge features two open-air restaurants with delicious international and local cuisine, and a pool-bar with an inviting waterfall (above, right), where you can enjoy exotic tropical cocktails. The lodge has 54 comfortable rooms with private bathrooms, hot water, and ceiling fans. Rooms have either three single beds or one double bed and one single bed. The hotel has the capacity to host up to 100 people. Manatus VIP Hotel in Tortuguero offers guests a unique combination in the area: Luxurious comfortable rooms and facilities, a delicious restaurant with an international and gourmet cuisine offering Caribbean fusion food, the relaxing services of a spa, and the excitement of a variety of adventure tours, all just a few steps from the world famous Tortuguero National Park. 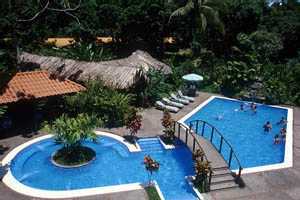 South of Limon lies Puerto Viejo and Punta Cocles, and nearby is Cahuita National Park, offering visitors a transitional subtropical forest and uninhabited, white sandy beaches with coral reefs for snorkeling and scuba diving. Roads are mostly unpaved, and hotels are casual and unpretentious. 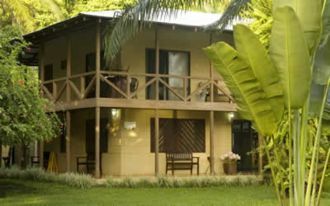 Surrounded by lush tropical gardens, Cariblue Hotel offers 25 spacious individual bungalows with telephone and hot water. 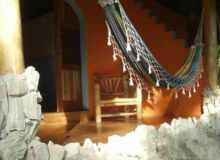 The hardwood and thatch-roofed bungalows have porches with hammocks, ceiling fans, mosquito netting, and are beautifully appointed with precious woods in a tropical style, and colorful hand-made ceramic tile bathrooms. Adjacent to Cahuita National Park, the Cariblue is just footsteps from a pristine beach.